This ivory and brushed gold leaf design place card frame is made of molded poly-resin and a detailed three-layered leafy border with an inner beaded border that highlights the photo. The back of the frame is made of black Kraft paper and has a hinged back with an easel that may be placed in both a horizontal or vertical position. 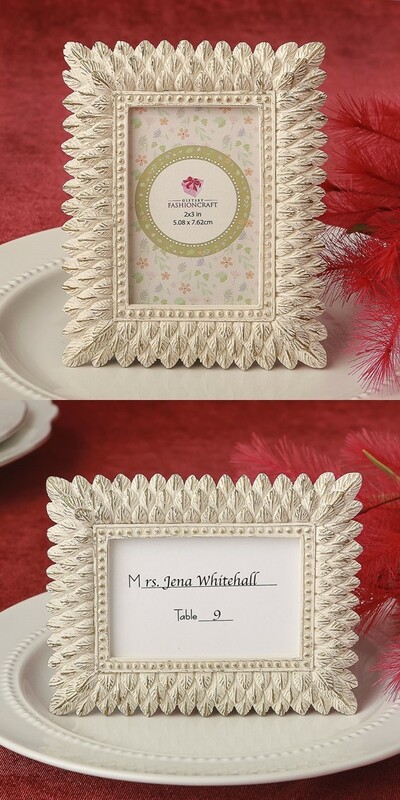 The frame doubles as a place card holder and a blank place card is included. Each comes packaged in a white paper box.